When I go into advanced setup and look at the Sqr footage with emitter rates…etc what are the best numbers to add to get the appropriate watering amounts. So, I have my trees for most part on their own feeds with 2GPH (7.57 in/hr) and each tree has 5 emitters for 16 trees (80 emitters say with 200 ft of drip line), so what are the best values to set up to get the most accurate watering details that feed into my moisture levels and appropriate Flex schedule setup? My shrubs are also on their own feeds with 1GPH (3.92 inch/hr) emiiters with around 15 - 20 plants and some with 1 - 2 emitters (Say 30 1GPH emitters). So, again what are the best numbers to use? Same question with my Lawn areas, I suppose that is also important to get an accurate sqr footage, but is there default number of heads that the algorithm uses? Example, all my Lawn areas have Pro-Spray PRS40 Bodies (40PSI Limiting Bodies) with different MP Rotator heads, so again what are the best numbers to use to accurately use Flex Schedule? First, start with one zone on Flex Daily, learn about the schedule, get it to where you like it, then move on to the next zone. It is easy to get overwhelmed and have poor results by doing it all at once and potentially using bad inputs. Bad inputs equals bad results. The trouble with drip systems is that sometimes they have been designed in a way that one kind of plant is going to have to suffer for the health of a priority plant. Emitter placement can often seem rather random, making it really hard to find a good Flex solution. I’ve designed my drip so that I set Flex Daily to water based on the largest tree and scale the drip emitters down for smaller trees. I add emitters as those trees grow. I use the largest tree’s drip line as the radius for my drip coverage area. One can also do this in reverse, water based on the smallest plant and scale the emitters from there based on individual plants. Looks like your setup might be straightforward! 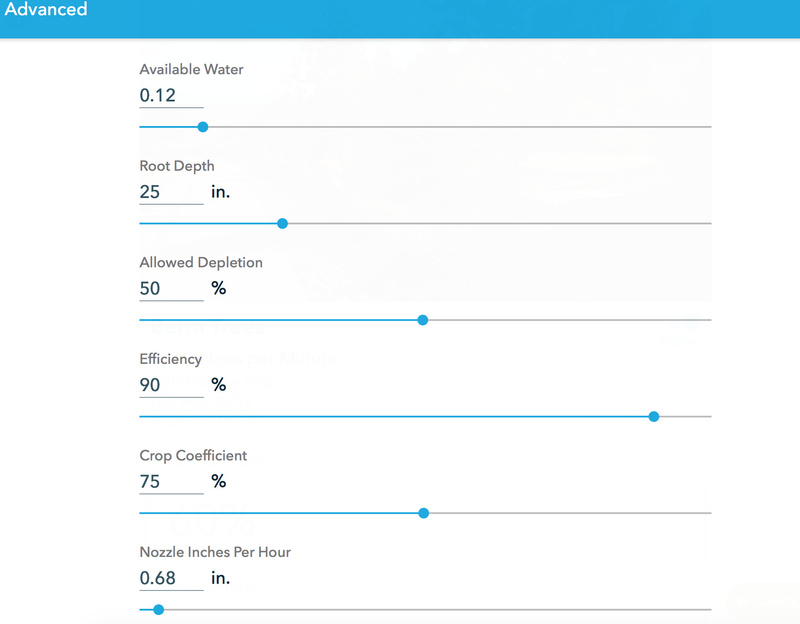 That said, check out this post and its linked spreadsheet to help figure how to set up your drip system zone settings (calculate precipitation rates in inches/hour etc). I think your current in/hr will see major adjustments if you carefully follow the post and spread sheet’s instructions. 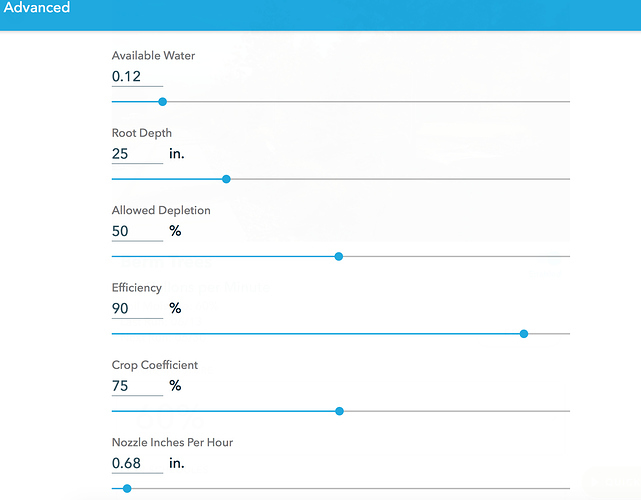 BTW as far as I know, square footage on Rachio zones are only used to estimate water usage without a flow meter. Thanks for the reply and spreadsheet. 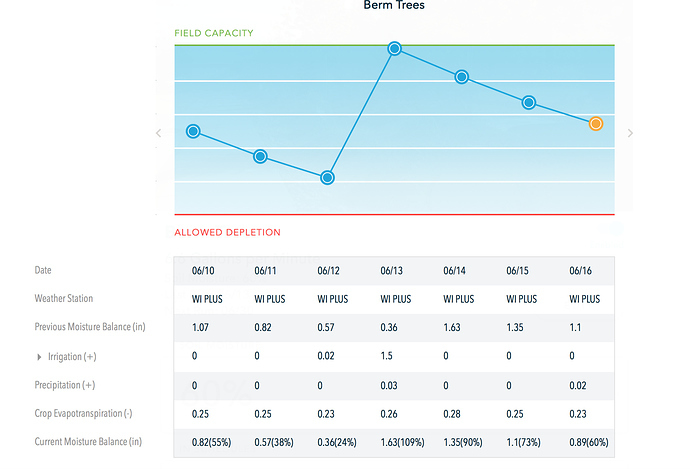 So, I added data in the spread sheet, 10 GPH per tree, 16 trees, 22 gallons to deliver for this cycle (maybe that is two much) with a 1.5 Flex Schedule number. The data input values came out at 353 sqr feet and 0.68 inch / hr… Now, when I check the schedule it wants to water for 21 hours, so two tree lines for 10 hrs each and another drip line for an hour, so would 10hrs seems to much and what needs to change? so two tree lines for 10 hrs each and another drip line for an hour, so would 10hrs seems to much and what needs to change? 10 Hours * 10GPH is 100 gallons per tree per watering. Was that your target you put in when you went through the spreadsheet? 22 Gallons per tree (5ft wide), so should only have two hr run time in theory. Did you get that 1.5 inches of water from your most recent Flex moisture table? If that changes you need to put the new value into the spreadsheet. Yes, from the Flex daily schedule. Would you please send a screenshot of the moisture table. That sounds odd to me. The only thing I can think of is that you don’t have the custom nozzle attached to the zone so check that too. Attached and I am using the default emitter at 0.5… so, How do you set up a custom head type? Doesn’t seem that should result in that many hours of watering. I’ve got a similar setup but at 0.3in/hr and only waters 4 hours. My available water is 0.11. So at 0.68 that ought to be close to 2 hours. Is your sprinkler “head” set to anything other than emitter/drip with smart soak enabled therefore allowing cycle and soak? That is only for use with lawn sprinklers and therefore is not enabled if the sprinkler head is set to emitter. Actually your screenshot shows 0.68 in/hr at the bottom of the screenshot. That 1.5 inches-of-water you used is for 6/13. Forward to next week to see what the next watering uses. My guess is that when you tweaked settings the number changed, so you’ll need to plug the new number into the spreadsheet. Is your sprinkler “head” set to anything other than emitter/drip with smart soak enabled therefore allowing cycle and soak? That is only for use with lawn sprinklers and therefore is not enabled if the sprinkler head is set to emitter. Also set your efficiency to 100%. It won’t make a huge difference but the calculator assumes 100%. And @knighti10 if you do need to change the sprinkler head type to emitter, be sure to reinput your custom precipitation rate afterwards. It’ll probably be overwritten. Is it still saying that you’re going to irrigate for 10 hours? No now they look reasonable with their times, two tree lines set for 2 hrs 5 mins, so 22 Gallons, and the other slightly less at 1 hr 45 mins. We have some precip coming, so I will see how this runs. I have one drip line for shrubs that has over 60 plants and that is set to run for 6 hours to get 4 gallons with a setting of 0.15 nozzle setting. So, I reviewed the forecasted schedule and that Flex number went from 0.48 on 6/13 to 0.9, so that then changed the nozzle rating to 0.23. After this the time came down to just over 3 hours. So, bottom line I need some run time and will monitor. Thanks again for all your inputs… GREAT Spreadsheet. Awesome! It took me a few months of observing my trees before I stopped second guessing the controller or my settings — though got a heat wave coming up next week so I feel that’ll be a critical test. So far my trees are flourishing. Same here. I had to get through all 4 seasons here before the tweaking was over.